The band’s previous album, The Killer Instinct, was released in 2015 to widespread critical acclaim and went on to score multiple radio playlists. A solid year of worldwide touring culminated in December 2015 in an UK arena tour alongside Def Leppard and Whitesnake. “Angst, passion, power, glory, love, truth, lies, loyalty, questions that begged to be answered. There’s a guitar army coming and it’s bringing the “Heavy Fire.” ­ – Ricky Warwick (vocals), Black Star Riders. 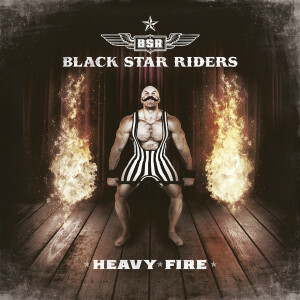 After a full year off the road, Black Star Riders (Ricky Warwick, Scott Gorham, Damon Johnson, Robert Crane and Jimmy DeGrasso) are back with a 16 date UK & Ireland run, joined on the first five dates by Scottish rockers Gun and The Amorettes and then Sweden¹s own Backyard Babieswith Gun on the remaining 11 shows.